The Jeeves Collection is Amba's flagship Towel Rack. 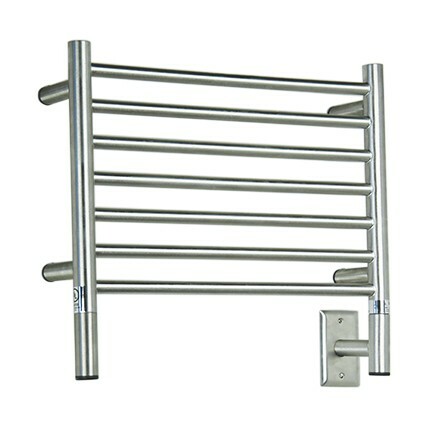 A timeless hardwired towel warmer design that is efficient, reliable and long lasting. These liquid filled towel racks can easily accommodate large towels. The Jeeves collection features a classic towel bar design featuring liquid-filled round bars which allows them to be the perfect addition to any style of bathroom. These models self-regulate to maintain the ideal internal temperature while reducing power consumption. 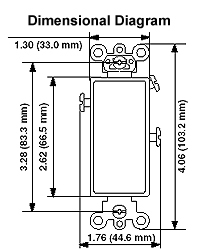 They are hardwired units and have a replaceable heating element. Contain a lower output heating elements or fewer bars which means that they will not be as effective as other models. All Amba Jeeves Now On Sale! 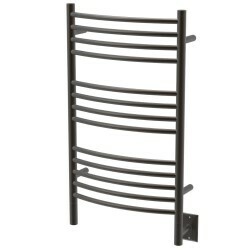 This classic towel heated towel rack design features 13 horizontal bars in a 4-4-5 bar configuration. Suitable for 1-2 full-size towels (folded). 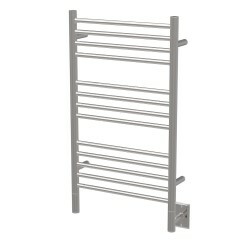 This classic towel heated towel rack design features 12 horizontal bars, in a 5-7 bar configuration. The bars are ideally spaced to hold 2 towels. This classic towel heated towel rack design features 7 straight horizontal bars, ideal to hold 1 towel. This classic towel heated towel rack design features 4 evenly spaced horizontal bars, in a traditional ladder style. Suitable for 1-2 full-size towels (folded). This classic towel heated towel rack design features 6 evenly spaced horizontal bars, in a traditional ladder style. This classic towel heated towel rack design features 10 straight horizontal bars, in a 3-7 bar configuration. The wide bars are ideally spaced to hold 2-4 full-size towels (folded). This classic towel heated towel rack design features 10 straight horizontal bars, in a 3-7 bar configuration. The extra wide bars are ideally spaced to hold 3 towels and small hand or face towels. This classic towel heated towel rack design is unique. It features a shelf with 7 straight horizontal bars plus an additional 4 bars on the shelf. Suitable for 1 full-size towels (folded) hanging, 1-2 small towels on shelf (folded). Allows user to set On/Off times each day. Great for those who use their towels on a regular schedule. Allows user to turn on their heated towel racks for a specific amount of hours. 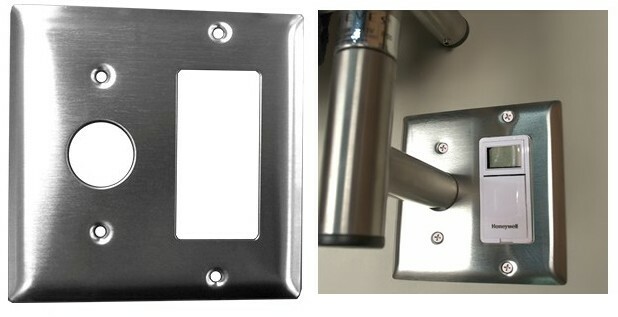 Also has a simple on/off switch. Liquid-filled System: these heated towel racks contain a water/glycol mixture that is heated by a rod-like heating element running along one of the vertical bars. The warmed liquid rises as it heats up until the entire rack reaches it's maximum temperature. This technology will take longer to heat than a dry-element, but is a more energy efficient system. 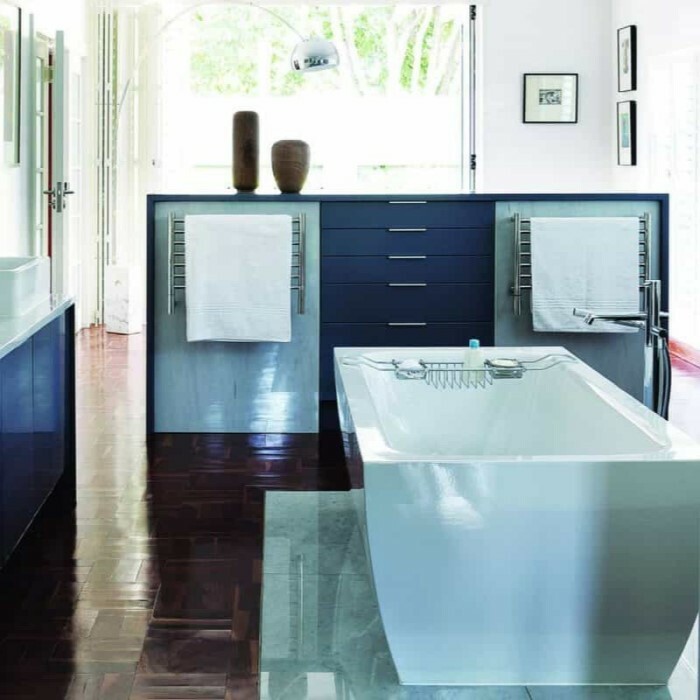 UL-certified for use in the USA and Canada, the Jeeves units are approved for installation around water sources and above bathtubs. 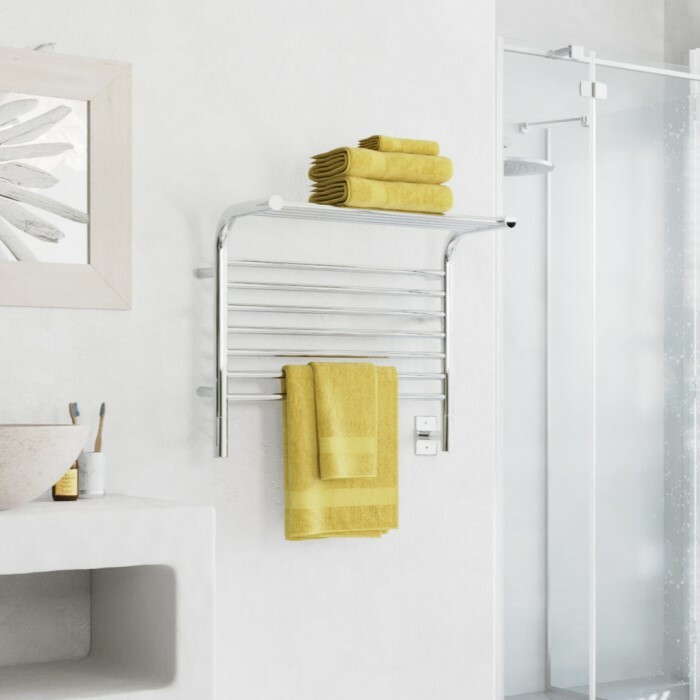 Easily replaceable heating elements means you can get years of use out of this towel warmer – far beyond its warranty.